A few months back I was made aware that theHunter: Call of the wild was coming to consoles, a game I'd been watching a few videos on before this news was revealed after seeing a video advertised on YouTube one day. My hunting skills have only ever really stretched to games where I've hunted for fish and dinosaurs if you count Ark. so the chance to shoot cute things for no real reason other than sport was a whole new thing for me. I cried like a big baby when the family rabbit died only a few years back, so what chance would I have shooting cute animals and chasing them down to collect them as a trophy. Turns out these bloody animals weren't going to hang about for me to ever worry about that. 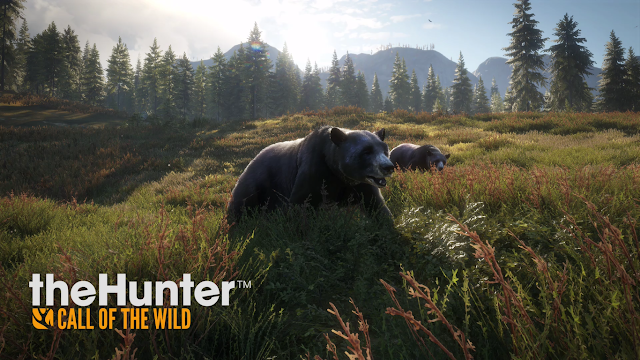 TheHunter gives you two reserves to play on and explore, the Hirschfelden hunting reserve and the Layton Lake District. Both of these are bloody huge maps to explore, with each of them not only littered with a load of animals for you to go out and shoot, but also to explore to find places such as outposts (places you can buy things from, rest, and fast travel to), landmarks, lookout points (shows new places on the map) and a bunch of collectibles which all give you XP. While the main point of the game is to hunt down animals that will earn you cash to buy new weapons and items to play with, the game also throws missions your way which ask you to do things such as harvest (shoot) a certain animal in an area, or even things like taking a good picture with your handy camera. Doing all of this stuff will give you the cash and XP ranking to buy new rifles, shotguns, and even bows, to things like callers (think of that cow toy that goes mooooo when tipping it) which attract that animal to your area if in hearing distance and not alerted. On top of all that you've also got skills and perks to unlock too, which you do so by points you earn when ranking up and by doing certain things. Perks are for weapons, so things such as steady aim and breath control when aiming are a few that jumped out at me. Skills are either stalker or ambusher. Stalker offer skills that make you less noisy and less visible, where ambusher lets you get stronger scents to attract animals or increase the reward by 5% from missions. Both of these offer way more than the ones I've mentioned, and will, of course, make hunting a little bit easier and rewarding. While theHunter: COTW will not be to the taste of every gamer out there, I myself have lost track of how many mornings I've lost to it when loading it up to finish this review. Looking at the clock only to see I've somehow lost an hour or two while hiding myself among trees hunting, or checking out what that ? was on the map. The game is far from perfect mind you, with certain glitches happening to me in my 25 or so hours of playing time so far. While some are just silly things like animals just standing there outside an outpost acting like I'm not even there after hitting one with my ATV. The worst ones have been to do with items going missing. Every now and then the game has decided to totally remove my ammo or my sight from my rifle while playing, making me go to my inventory to equip them again. The biggest annoyance, however, was when the game decided to take a weapon from me completely, and also the 6000 credits I spent on unlocking it. There was no other way of getting it back other than earning the credits yet again to unlock it again, and what made it worse was that one of the next story missions needed me to use that weapon. The worry of when the game will decide to screw me over again has me now playing the game worrying about if things will save every time I unlock something. Touch wood it has been okay other than that so far, but it certainly put me off the playing the game for a few days. Two things left to briefly touch on, and that's MP and how the game looks. While MP is included in the game and it allows you to join randoms and friends online to hunt, I can't really say I've dug that deeply into due to no one (other than a couple of reviewers) owning the game on my friend list. When I did play it I had moments where one guy just stood by my side and would fire right next to me, so it just got annoying and I left it never to return. I'm sure if mates had the game this would all change though, as I can see a bunch of mates hunting down animals making for hours of fun. The online also throws in some competitions which you can select if you are the host, with things like spotting five animals, to shooting an animal in the heart being ones I've seen so far. Cash and XP carry over into both modes, so you will always gain both no matter if playing online or offline. Lastly just how well the game looks. I went in fully expecting something along the lines of Farming Simulator, and I did get that but way better. I've had moments where the game looked totally stunning, so much so I've felt the need to stop what I'm doing and snap a picture. The sky is right up there with Forza Horizon, with these reserves while looking mostly the same after a while, can also throw a surprise of a castle or just nice looking horizon in the distance. 100% better than what I thought I was going to get with this game. That being said things close up can look a bit average. I'm talking to you Mr dead animal. Overall: I've had a load of fun with theHunter: Call of the Wild, I cannot lie. While it might not be to the taste of everyone, I've found it a good game to just chill out with, with minutes passing of just hearing outdoor forest noises as I wait for some stupid animal to ignore the fact I'm the worst hunter out there and sacrifice himself for me. Sounds ALOT better than the arcade shooter type hunting games I've played in the past. Sounds good, if they continue to add content, I could see it looking (and hopefully selling) even better. Great review,Tony! Unless you count Duck Hunt, the only games I've killed animals in are survival games like Tomb Raider. Not sure how I feel about sport hunting. Game looks decent though.